Pepe The Frog first appeared on the internet in the mid-’00s as a lighthearted stoner in Matt Furie’s online comic Boy’s Club. Now, cursory Google images of the character find the frog flaunting swastikas, chainsaws, and Donald Trump propaganda. How does this happen? How does a harmless meme become an ideological vessel by an entire subculture that its creator felt the need to kill off for the greater good of humanity? Not even Furie can explain it. A staggeringly comprehensive and complicated video from Shots Fired breaks it all down, tracking the exact moments in time when Pepe evolved from goofy meme to weirdo mascot to worldwide sensation to harbinger of mass violence and symbol of right-wing hate. Basically, blame 4chan. And bodybuilding forums. Always blame bodybuilding forums. 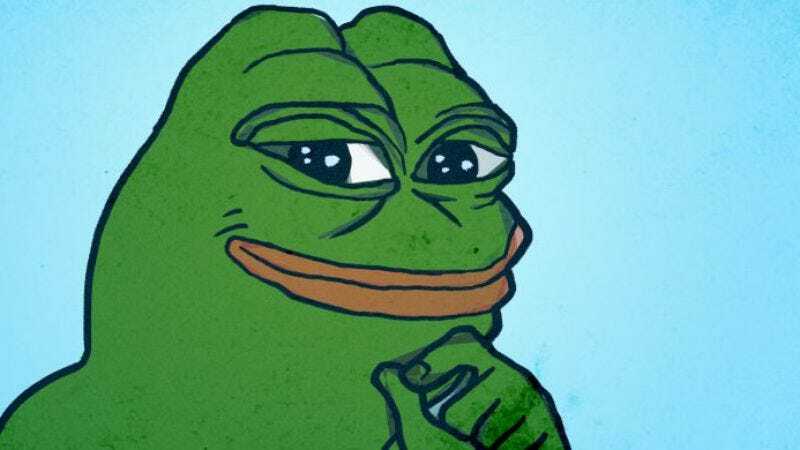 At one time, Pepe served as a means of criticizing The Big Bang Theory; at another, the frog was the envy of art collectors willing to drop nearly $100,000 dollars for “rare Pepes.” If you were never quite sure how that all happened, well, this video will catch you up, before Donald Trump names Pepe the new ambassador to the United Nations.